Enable the multilang filter for content and headings. Create a new Drag and drop onto image question. Upload the attached redblue.png as the background image. Move both items to an appropriate place on the background (drag with the mouse, or type coordinates left 50, top 100 for item 1, left 50, top 300 for item 2. Cross check in english you see the english question text and labels. Cross check in russian you see the russian question text and labels. Allow the labels to drag onto an image to have multilang labels. 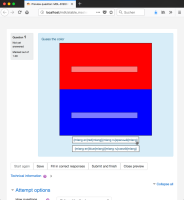 Rules about which HTML tags are allowed should be relaxed to allow Standard Moodle multilang https://docs.moodle.org/34/en/Multi-language_content_filter to work. multilang2 https://moodle.org/plugins/filter_multilang2 should probably also be supported.